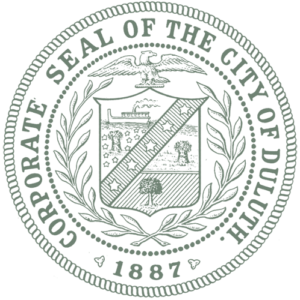 The seal for the City of Duluth, established (for the second time) on March 2, 1887. 1854 | 1854 Treaty of La Pointe opens settlement on the “Minnesota side” of Lake Superior. 1854 | Townsite surveyed and platted by Richard Relf (unofficial: anecdotal information provided by pioneer James Bardon). 1855 (March 3) | Minnesota’s Superior County is renamed St. Louis County. 1855-1856 (winter) | Township of Duluth at the base of Minnesota Point platted by its incorporators. 1857 (May) | Duluth incorporated as a village by George E. and William Nettleton, J. B. Culver, Orrin W. Rice, and Robert E. Jefferson. 1858 | The townsite of Duluth is officially platted. 1870 (March 6) | Duluth officially becomes a city for the first time. It adapts a “Ward & Boss” system of government in which a Common Council was made up of two aldermen representing each of the City’s (then) four wards. One alderman would be elected for one year, the other for two. Each ward also had its own Justice of the Peace and a constable. City officials also included a mayor, treasurer, city Justice of the Peace, City Clerk, City Comptroller, Street Commissioner, City Engineer, City Assessor, and City Attorney. 1873 (September 18) | Panic of ’73 caused by the failure of Jay Cooke’s banks. Most of Duluth businesses fail. Population drops from over 5,000 to less than 1,500. 1877 | Out of money, Duluth city officials allow its city charter to expire. 1877 (October 22) | Duluth returns to village status. 1887 (March 2) | Duluth regains its status as a city. It adapts a “Ward & Boss” system of government as it had in 1870, in which a Common Council was made up of two aldermen representing each of the City’s (then) seven wards. In this system, the mayor appointed many city officials, from the City Engineer to the Chief of Police; often when a mayor was elected, he replaced any city official that did not belong to his political party with someone who did. 1913 (April 14) | Duluth begins its era of a Commission Form of government in which the mayor and four elected commissioners were in charge of different aspects of city government: public affairs, public works, public safety, public utilities, and finance. The mayor served as commissioner of public affairs. 1956 (March 20) | Duluth’s Mayor / City Councilor form of government, still in use today, is officially adapted.